For twenty years of his life--his entire childhood and youth--Joasaph was confined to the castle. During this time he was taught the skills of wisdom and warfare. The King visited his son often, and was pleased to find his boy growing into a fine, strong young man. Finally, convinced that the prophecy was false, Abenner agreed to let the Prince see his future kingdom. The impression Joasaph received seemed mixed. The world was indeed a very beautiful place, but the sins, sorrows and eventual death of man dimmed its beauty in Joasaph's eyes, and made him doubtful. No longer content with his luxuries in the palace, he strove to find a life that was soul-fulfilling, unlike what he felt succession to the throne would be. According to the account of the lives of Barlaam and Joasaph, "at that time there was a certain wise monk, who glorified God both in his life and with his mouth, and had passed through all monastic training. Where he came from, and what his lineage was, I cannot say; but he had taken up his abode in a desert of the land of Senaar,* and had become perfect in the grace of the holy state. Barlaam was the name of this old man. He then it was, who, learning about the king's son by a revelation from God, came out of the wilderness to where men dwelt. Changing his own monastic garb for a lay dress, and embarking on a vessel, he came to the kingdom of India. Then in the guise of a merchant he made his way to the city where the palace was of the king's son. After residing there for many days, he made precise inquiries concerning the prince and the people about him." Having therefore arrived in India, Barlaam, disguised as a merchant with a "pearl of great price," was able to get into the castle. Barlaam explained the Orthodox Christian faith to the young Prince, who in turn was immediately devoted and demanded to be baptized. In the months that followed the entire household was converted, including King Abenner who eventually became a hermit. Barlaam left again to live a life of silence, asceticism and prayer at Senaar, Abenner reposed and Joasaph became king. But he was not content there and missed his spiritual father. Finally he gave his kingdom to relatives and went away to the desert in search of his teacher Barlaam, wearing the hair shirt given to him by Barlaam. For two years he wandered about through the wilderness, suffering dangers and temptations, until he found the cave of Barlaam, laboring in silence. The Elder and the youth began to struggle together. 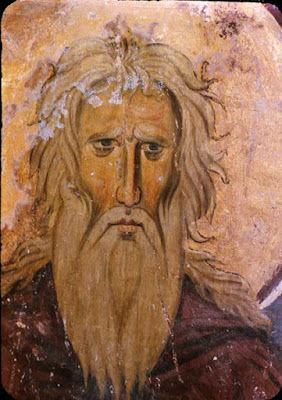 When Barlaam’s death approached, he served the Divine Liturgy, partook of the Holy Mysteries and communed Joasaph, then he departed to the Lord. Barlaam had lived in the wilderness for seventy of his one hundred years. After he buried his elder, Joasaph remained in the cave and continued his ascetic efforts. He dwelt in the wilderness for thirty-five years, and fell asleep in the Lord at the age of sixty. * Senaar could refer to either the area of Mesopotamia near Babylon, or in Africa. Some believe that the India referred to in this tale is a reference to a place south of Egypt in Africa, which was also called India in the ancient world.